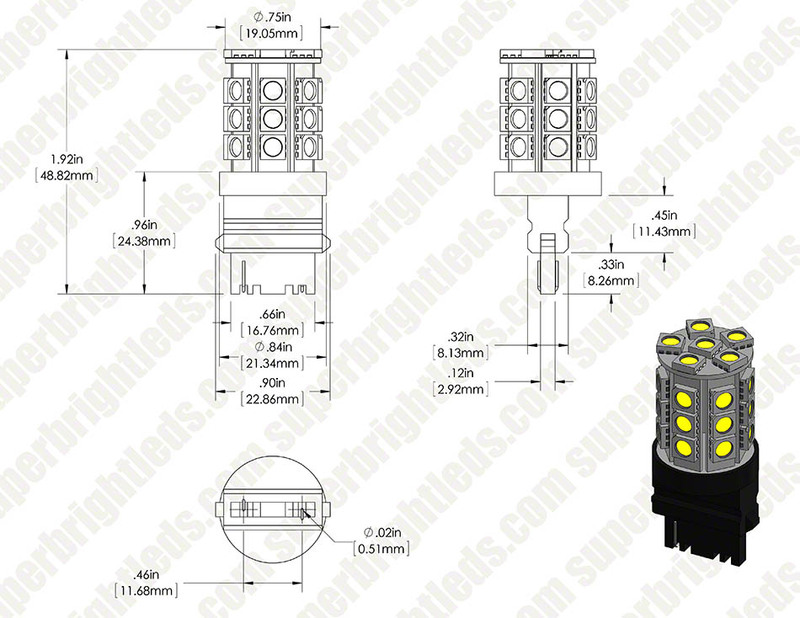 3156 LED Bulb - 27 SMD LED Tower - Wedge Retrofit: 360° View. 3156 LED Bulb - 27 SMD LED Tower - Wedge Retrofit: Front View. 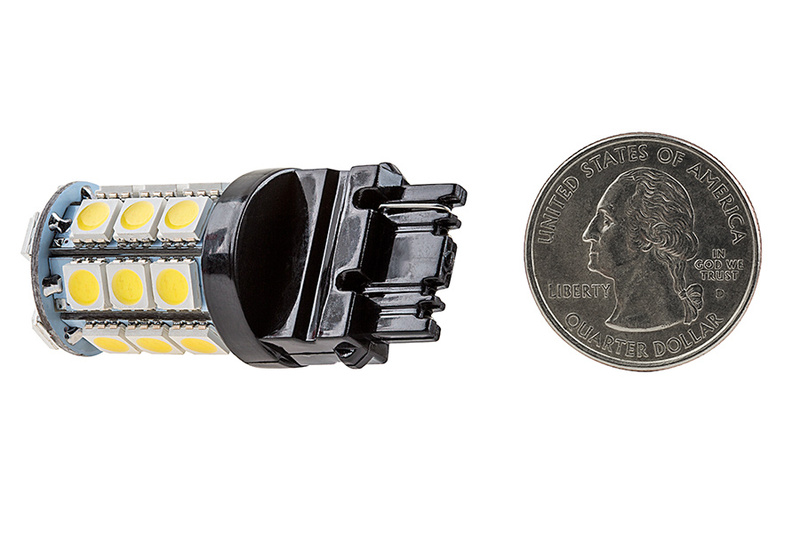 3156 LED Bulb - 27 SMD LED Tower - Wedge Retrofit: Shown On In Red, Amber, And Cool White. 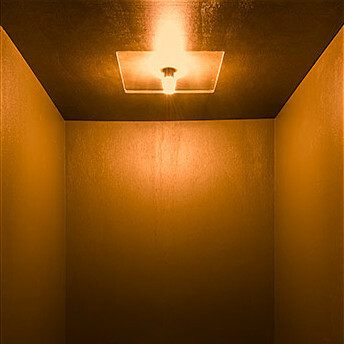 3156 LED Bulb - 27 SMD LED Tower - Wedge Retrofit: Shown Installed In Overhead Light Fixture. 3156 LED Bulb - 27 SMD LED Tower - Wedge Retrofit: Shown Installed In Overhead Light Fixtures. 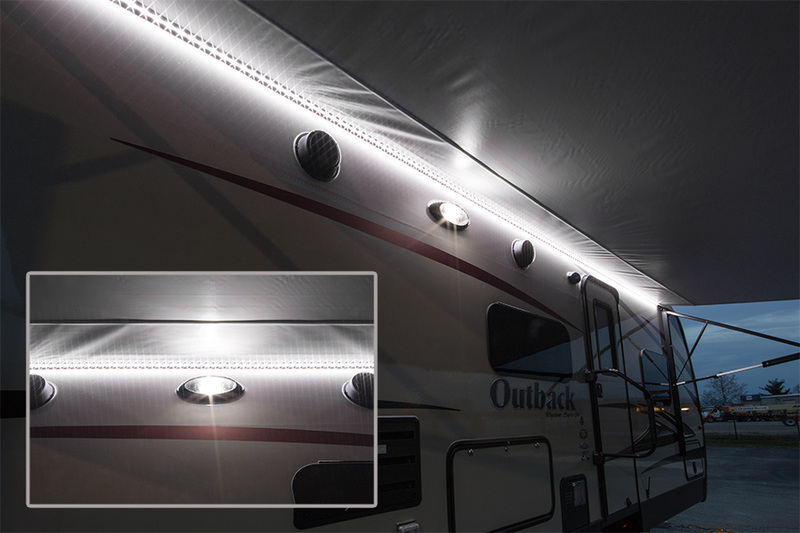 3156 LED Bulb - 27 SMD LED Tower - Wedge Retrofit: Shown Installed In RV Flood Light Fixture. 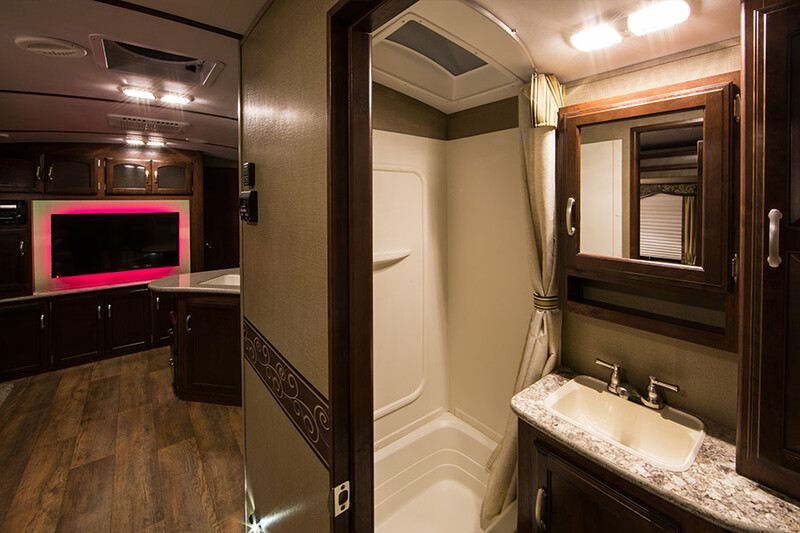 3156 LED Bulb - 27 SMD LED Tower - Wedge Retrofit: Shown Installed In RV Running Light And Flood Light Fixtures. 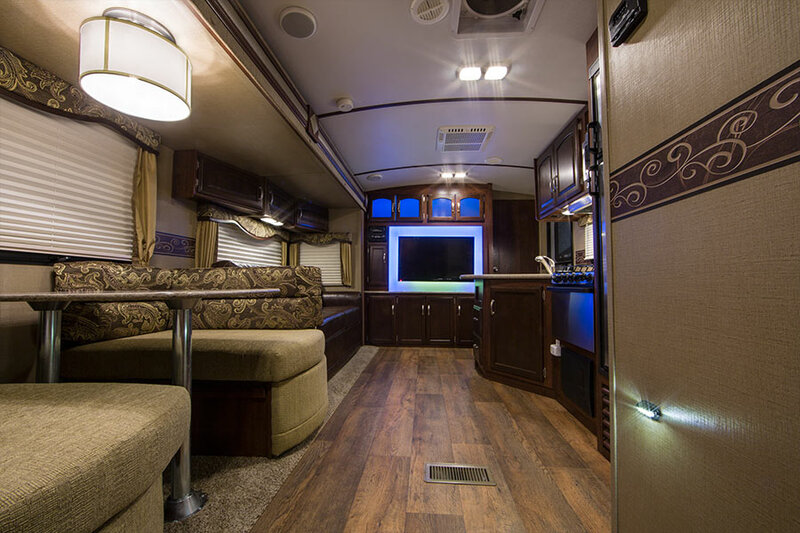 LED replacement bulbs can fit numerous boat and RV applications such as navigation lights, cabin lights, dome lights, tail lights, brake lights, reverse lights, turn signals or side marker lights. 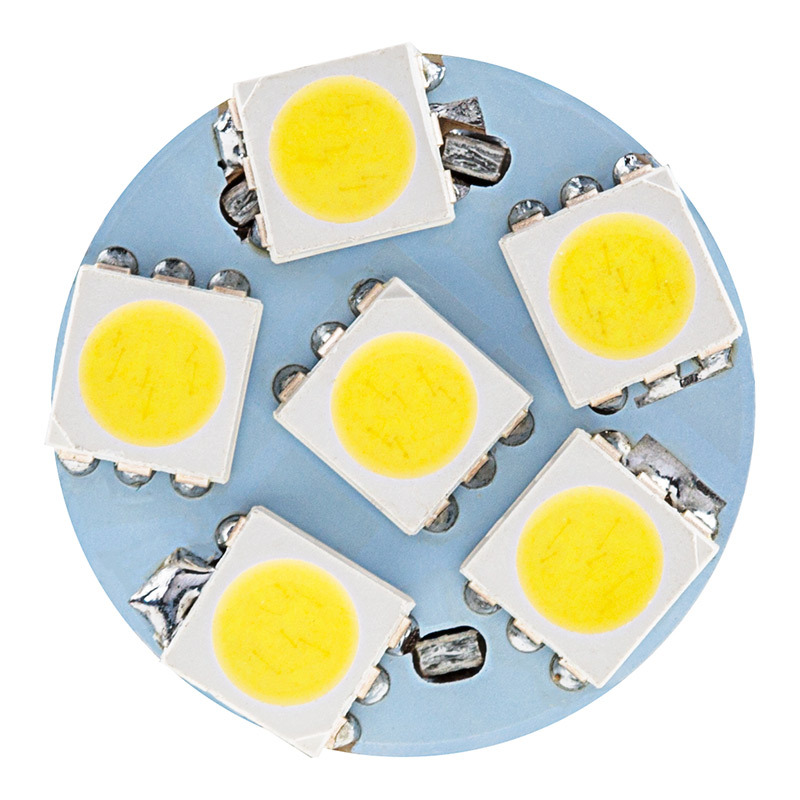 This 3156 single-contact bulb has 27 LEDs that create a 360° viewing angle for better, allover light emission with reduced hot spots. 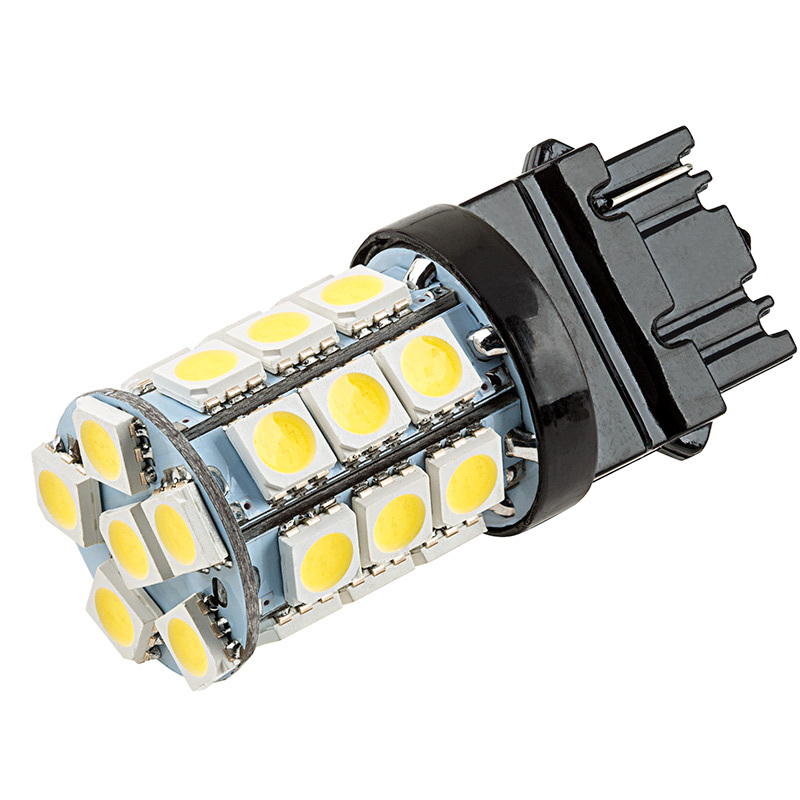 Produces up to 290 lumens at 6200K. 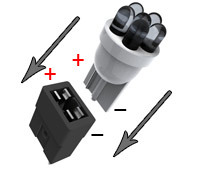 Tower-style design with a 16-mm wedge base for easy plug-and-play installation. 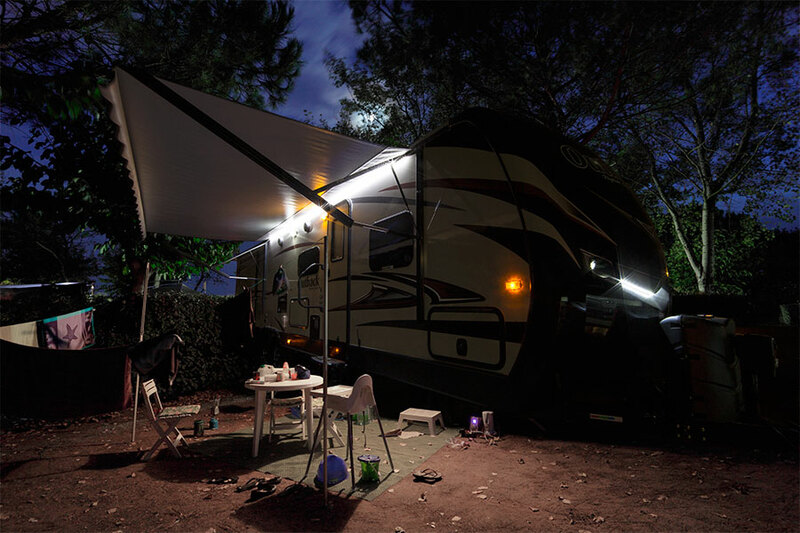 The energy-efficient bulb operates within a wide 10-30V DC range and is designed to last 30,000 hours on your motorhome or boat—25 times longer than incandescents. Available in cool white, amber and red. Not sold in pairs. Price per bulb. Would recommend to anyone. Used in an '03 Silverado 1/2 ton as the reverse lights and are a lot brighter than the stock incandescent and way cooler looking. I replaced the original reverse light bulbs (old style incandescent) with the 3156 LED replacements on my 1997 Firebird Formula. The original didn't provide much illumination while backing up, like there was nothing lit back there at all. After switching to these LED 3156 lamps it has made a nice improvement. These are bright white whereas the originals were a yellowish color and nowhere near as bright. I highly recommend them. You'll see everything behind you. 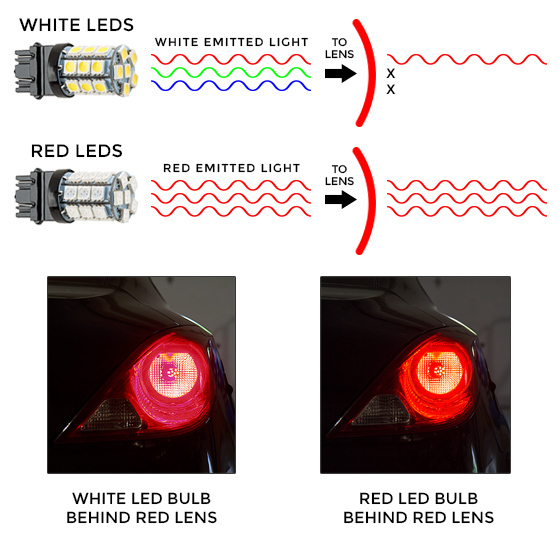 I purchased a pair of these for my 2000 Ford Explorer, and they're really bright! 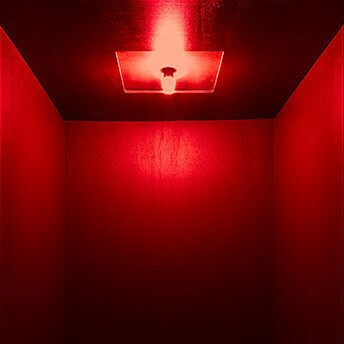 I'm not sure why the other person says these bulbs are worse than incandescents. 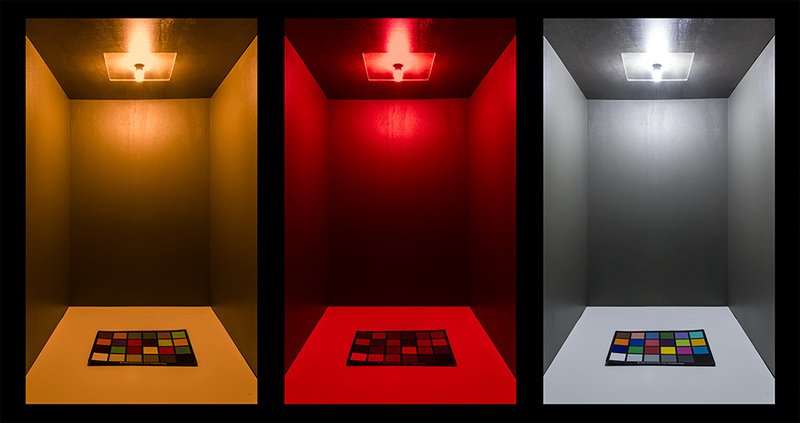 They easily produce four times more light than the incandescent bulbs I had before, maybe even more. 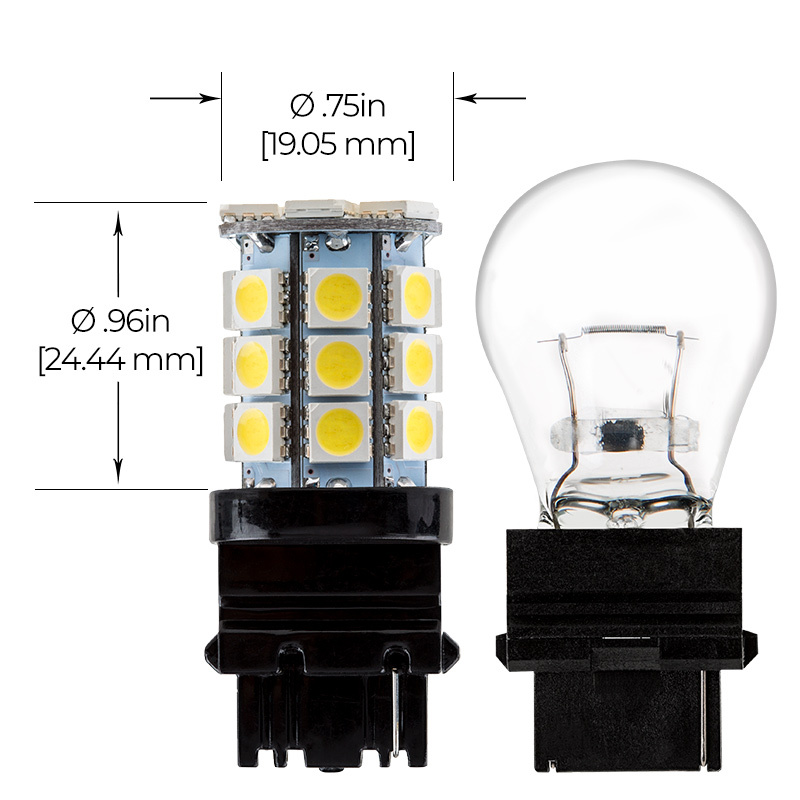 They're a nice white color which is an upgrade when compared to the yellow oem bulbs, they also completely illuminate the area behind your vehicle, unlike incandescent bulbs which seem to only alert other drivers that you're backing up. Definitely a good product. Great product, great service, great price. Thanks.